I have been pickle obsessed since I was born. I would hoover baby dill pickles, jar after jar as a kid and it’s really no different now. Pickle juice? No problem….I’ll drink it. Now that I’m an “adult” (ew!) I enjoy pickles in a variety of ways such as, picklebacks – where you take a shot of Jamison Irish Whisky and follow it up with a shot of pickle juice. 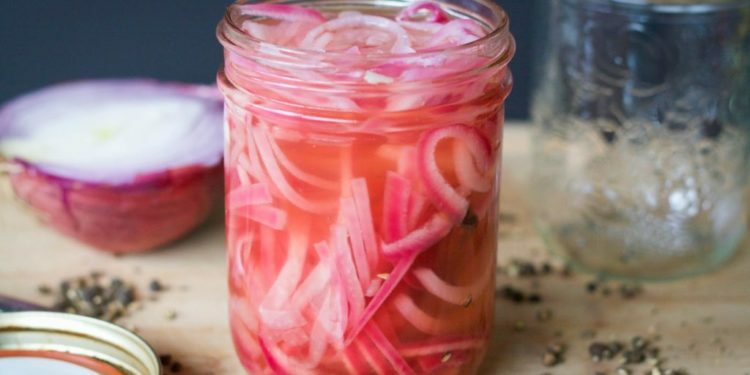 I have also come to enjoy a variety of other pickles like pickled beets, mustard pickles, pickled beans, pickled asaparagus and of course pickled onions!! 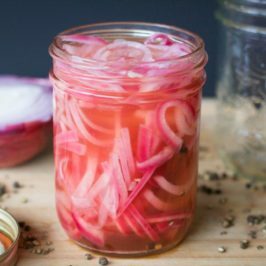 I think that Vancouver taco craze got me started on pickled onions. 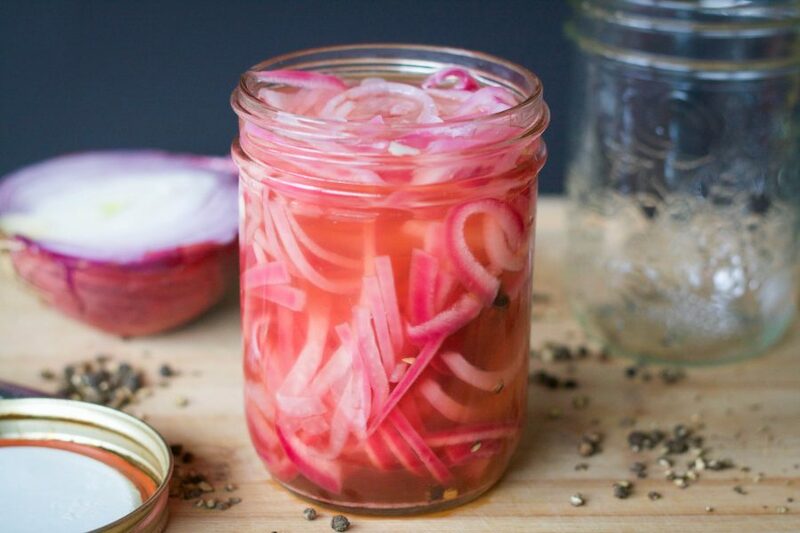 The sweet, tangy, pink onions are the perfect addition to any type of taco. They are so easy to make, I think it’s imperative to have them on hand for any Taco Tuesday at your house! With literally 4 ingredients and maybe five to ten minutes of prep time there is no excuse. Ya just gotta enjoy these little pickley bites! You can leave these guys plain or spice them up with some peppercorns, herbs, cinnamon sticks, citrus zest or chilis. I went with peppercorns and a cinnamon stick but either way…you’re going to love ’em! 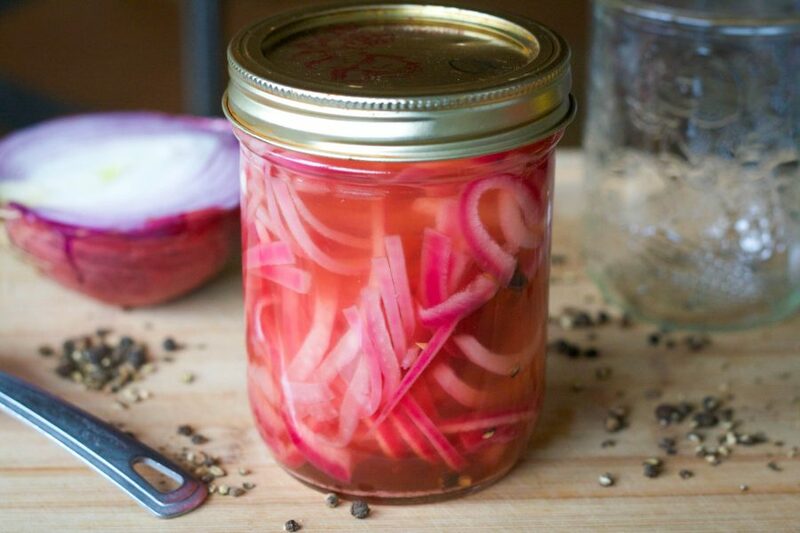 The quickest way to add lots of flavour to your tacos, salads and burgers! In a small pot, bring 2 cups of water to the boil. 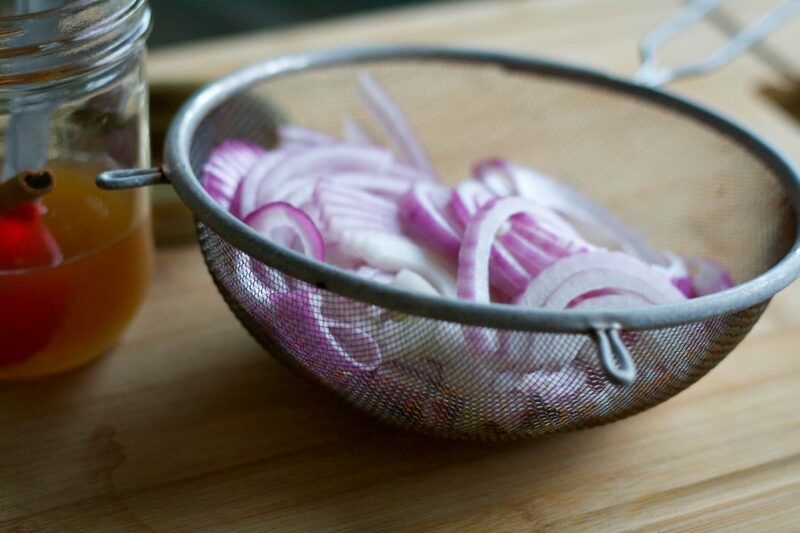 Place the onions in a sieve and slowly pour the boiling water over them. Drain well. 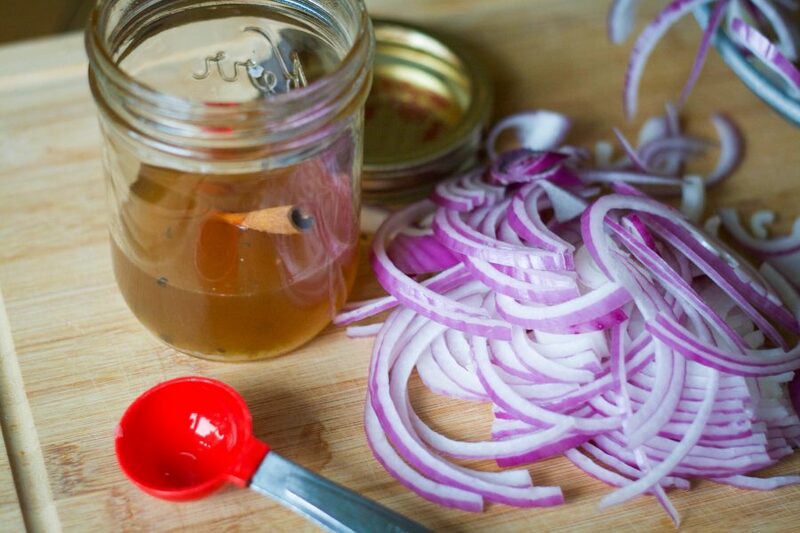 In a small mason jar, combine the vinegar, salt and sweetener. Stir until dissolved. If using any additional flavourings (mentioned above) add now. 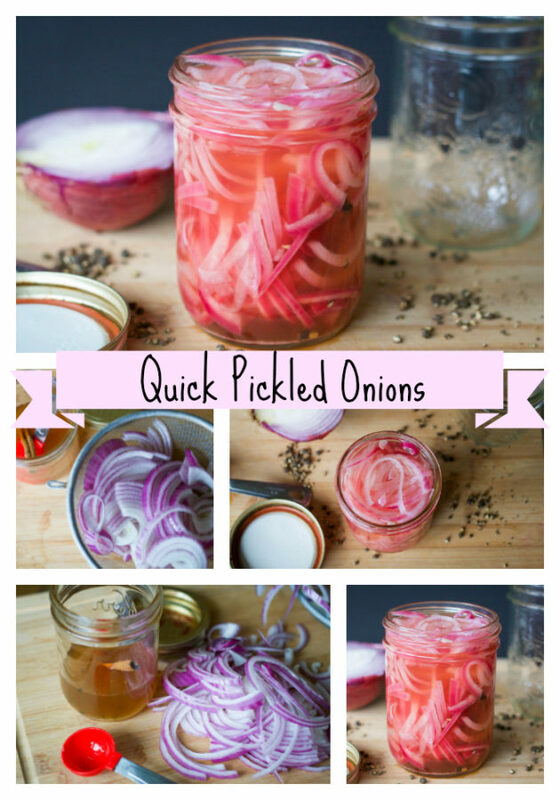 Add the onions to the jar, along with the warm water. 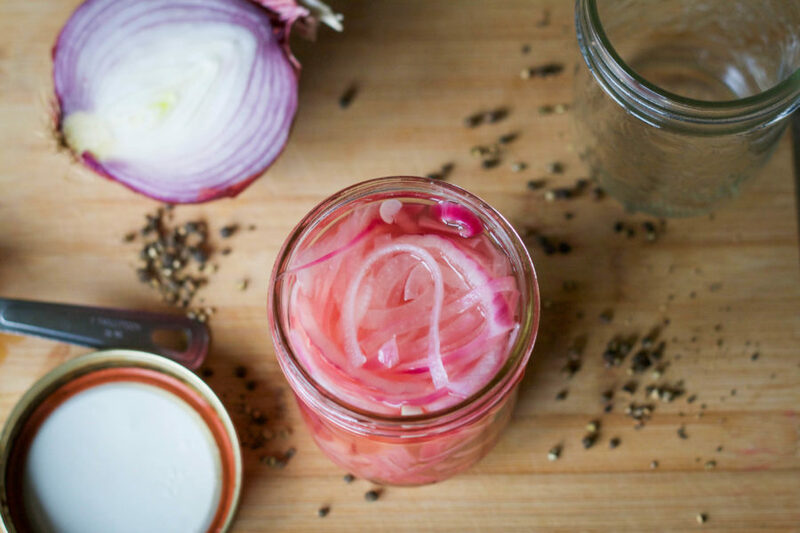 You may need to use more water depending on the size of your jar. Use whatever sweetener you have on hand - white sugar, coconut sugar or honey. Use as a topping for whatever you like - tacos, burritos, soup, salad, sandwiches or burgers! Can’t make them tonight? Pin it for later!